The trees have shaken off their snowy mantles. The early spring flowers have begun to poke their heads up through the hard ground. The robin puts in an appearance after his long absence. And fly anglers up and down the East Coast dust off their gear and check to ensure that their waders still fit. Yes, it’s that blessed time of year again—that time when every fly angler asks himself the same question: Where shall I fish? The water released from the Holston Dam is clean and cold and supports roughly 4,000 trout per mile. The trout here are primarily rainbows and browns; on a good day SoHo anglers can land several fish over 14 inches, though that certainly won’t be everyone’s experience. But one thing is certain: The SoHo’s trout are very strong and fight like crazy—especially the browns. The generation schedule on the SoHo changes often, which means the fish change their feeding locations and habits accordingly. Anglers should consider casting streamer patterns when power is being generated, or when fishing after a rainstorm when the water is murky. Wading anglers can access the river below the dam at several locations. Alternatively, consider tackling the SoHo by drift boat with a guide. Check in with local experts before you embark; they know the ins and outs of every bend of the river. South Holston River Fly Shop (southholstonriverflyshop.com) in Bristol, Tennessee, and Mountain Sports Ltd (mountainsportsltd.com) in Bristol, Virginia, are two hotspots. They carry countless local patterns like Kraft’s Kreelex, a great baitfish imitation that works wonders on trout. Should you wish to stay in the area to fish the Holston for several days, check into the South Holston River Lodge, which provides excellent accommodations and superb guides. For more information, contact Jon Hooper at South Holston River Lodge (southholstonriverlodge.com). To check the river’s generation schedule, go to tva.gov/sites/sholston.htm. Looking for quiet pools, rock walls, and rhododendron-covered banks? 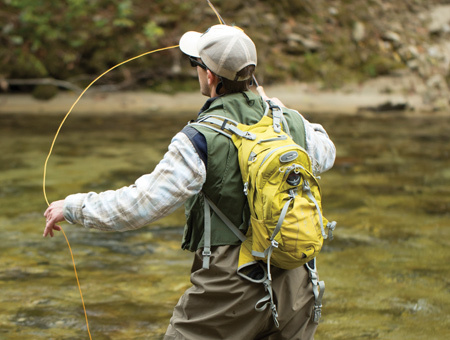 Look no further than North Carolina’s Davidson River, which is about as close to trout heaven as you can get. The Big D draws thousands of visitors each year but is mercifully protected from overdevelopment by the surrounding Pisgah National Forest. The lower reaches of the Davidson from the French Broad to Avery Creek are quite deep and hold most of the river’s water—and that’s good news: The state stocks heavily here, and general tackle rules apply. The bad news is that occasionally you’ll have to contend with tubers and spin anglers. In this area, anglers might want to try throwing big streamers early in the morning, especially if the water is off-color or high from recent rains. Most fly anglers fish the catch-and-release section from Avery Creek upstream to the headwaters of the river. The fish hatchery that operates on the Davidson has abundant parking, but don’t go looking for solitude. The browns that call this section of the river home look like miniature submarines and prefer to lie along the banks, occasionally surfacing to take in a midge. The upper reaches of the Davidson are quite small; anglers can actually hike up to the point at which the river is nearly small enough to jump across, though they’ll have to do some bushwhacking. You’ll find tight cover up here; prepare to roll cast. The good news is that this part of the river sees much less pressure. If quarters are too tight, then move back downstream. The river will widen as it picks up more water, and the canopy cover will begin to abate. Numerous access points exist along Route 475 for those whose eyes are peeled. And don’t be afraid to check out Looking Glass and Avery Creeks. The Davidson in Pisgah National Forest is open to the public. For a few bucks, however, excellent private access is available through Kevin Howell, owner of Davidson River Outfitters. “You need to make your first cast count on the Davidson, because these are not forgiving fish,” says Howell. “I also recommend that you pay strict attention to your wading. Poor wading on the Davidson has saved more trout than catch-and-release ever has,” he jokes. Davidson River Outfitters carries all the flies you’ll need to fish here—but one of my all-time favorites remains Howell’s Big Nasty, an exceptional crayfish pattern Kevin Howell developed for North Carolina’s finicky trout. (Pssst: I’ve often used it for smallmouth bass.) For more information, stop by Davidson River Outfitters (davidsonflyfishing.com). The Peach State acquired Smithgall Woods State Park in 1994 from Charles Smithgall, a local businessman and conservationist. Smithgall agreed to sell his family’s private retreat—over 5,500 acres of pristine wooded landscape—to Georgia with the understanding that the state would preserve the area. State officials wisely agreed and today, in addition to the great fishing, visitors will find plenty of hiking trails, picnic areas, and spots to camp. Duke’s Creek delivers what you might expect from a mountain trout stream, complete with moderate canopy cover and spooky trout. This fishery is only four miles long and in most places less than 20 feet wide, but don’t let its small size fool you into thinking that this is an easy fishery. Overhanging branches make casting a challenge. You’ll have to navigate large boulders while you wade (though you can use them as cover). Wary trout use the logs embedded in the creek’s banks (to improve shore stability) as cover—and to break you off once they’re hooked. Yes, that was a 20-inch fish that just surfaced and smugly refused your fly—but no, it was a rainbow and not a steelhead. Broad shoulder browns also call this fishery home, and they delight in breaking you off not long after you set the hook. Jake Darling works as a guide for Unicoi Outfitters (unicoioutfitters.com) in Helen and offers some advice for rookies: “You have to fish deep here because these fish are large and aren’t likely to come up easily for a dry fly in the early spring.” Good patterns for Duke’s Creek include stone flies in various colors with a WD40 or black zebra midge as a trailer. Nestled in northeastern Georgia, Duke’s Creek is easily accessed by anglers in North Carolina, South Carolina, and Tennessee. Fishing here is catch-and-release only and is restricted to Wednesday, Saturday, and Sunday unless you have reservations to stay on site at one of the six lovely cottages that are open to the public at reasonable rates. A $5 parking pass is required. You’ll need to make reservations to fish. For more information on Duke’s Creek and Smithgall Woods State Park, go to gastateparks.org/SmithgallWoods. If you’re at the Gunpowder looking for falls, prepare for disappointment. The river has no falls at all and most likely got its name from a nearby foundry that produced guns during the Revolutionary War. The river was also the site of a copper foundry; in fact, the copper used on the Capitol dome after the War of 1812 was extracted from here. Though no one is extracting copper now, anglers do come from miles around to try their hand at extracting the local trout. The Gunpowder boasts an unbelievable population of wild trout ranging from 3,500-5,000 trout per mile, rivaling even the best Western rivers for fish per foot. Although the typical trout here is 9 to 10 inches, 18-inchers are not unheard of. Though you may catch rainbows and brookies, the overwhelming majority (about 95 percent) of the Gunpowder’s fish are browns. This river is filled with wild fish that don’t suffer rookie anglers lightly. Consider hiring a local guide to show you the ropes. The Gunpowder is nearly 53 miles long, but most fly anglers concentrate on three sections covering about 17 miles. The first section, stretching from Prettyboy Dam to Falls Road, is entirely catch-and-release and may be fished by traditional anglers as well as fly rodders. Blowdowns are plentiful here, and pocket water is abundant. Anglers need to pay strict attention to their patterns, as strikes will not only come fast, but the trout seem to know that running below the limbs of submerged trees provides a sure release from careless anglers. The second section of the river runs from Falls Road to York Road. This is classic trout water with runs, riffles, and the occasional long pool. The third frequently fished section of the river is deeper and much slower than the other two. This area stretches from York Road to Bluemont Road and is well worth your time. A word of warning: The fern cover is so thick along this river that in some places you can’t see your own wading shoes while standing on the bank. Proceed with caution. Gelsoe’s Little Black Stone Fly is a superior local pattern; you’ll find it and anything else you’ll need at Backwater Angler (backwaterangler.com) or at Great Feathers (greatfeathers.com), both full-service fly shops very close to the Gunpowder. Virginia’s Rapp has a long and colorful history. The Algonquian Indians named the river Rappahannock, which means “rapidly rising and falling waters,” no doubt referring to its daily tidal fluctuations as it empties into the Chesapeake Bay. George Washington grew up along the banks of the Rappahannock River on his sister’s plantation, Ferry Farm, where he undoubtedly spent many youthful days fishing. The Rapp begins in the Blue Ridge Mountains and tumbles past the famed Rapidan River to its final destination. Because the Rappahannock empties into the bay, it hosts hundreds of thousands of migrating shad each spring. From the last week in March through the first week in May, anglers flock to the Rapp in search of these hard-fighting fish. Striped bass also migrate here, pushing the shad toward their own spawning grounds. They feed heavily on the shad as they migrate upstream, and they have been known to slam the fly of inattentive shad anglers. Spin fishermen favor the Rapp, particularly during shad season; fly anglers should also expect to share water with all varieties of paddlers. Most of the time, though, there is plenty of water for everyone; anglers should keep their eyes open for small watercraft and expect to be flexible in their positioning. If you see a kayak, simply hold your cast. Unlike skittish trout, shad appear oblivious to kayaks and other watercraft. Shad tend to stay deep in the water column and generally don’t rise to flies, but they do aggressively strike at bright subsurface patterns. One of the prime locations anglers visit when fishing the Rapp is just below and above the Route 3 bridge in Fredericksburg, Virginia. In the spring it’s not uncommon to look from the bridge and see schools of shad so thick that they black out the bottom of the river. You can park your vehicle along River Road or in Old Mill Park and then wade up or downstream. A word of caution: Wade safely. The Rappahannock is dangerous, fast-moving water. Remember, too, that more than one angler has walked out onto rocks to reach a prime spot in the river only to find those same rocks submerged by tidal flows when he tried to exit the river. Anglers who are interested in the Rapp but are a bit intimidated by its size and power might prefer to hedge their bets and take a beginner trip with the Falmouth Flats Fly Fishers (ffflyfishers.org). These guys and gals are truly the experts of this river and are eager to help anyone who wants to learn. You have your pick of flies suitable for spring shad fishing, but for many years my go-to pattern has been Tommy’s Torpedo, created by fishing guide Tommy Mattioli. Tommy created several shad patterns, available at all Orvis locations throughout Virginia and at Green Top Sporting Goods (greentophuntfish.com) near Richmond. New River, W.Va. / Va. In his book Follow the River, James Alexander Thom relates the incredible true story of Mary Draper Ingels who, in the summer of 1775 at the age of 23 and already eight months pregnant, was kidnapped by a Shawnee raiding party. Draper later fled from her captors and traveled for 43 days, covering nearly 1,000 miles in rough country with nothing but the clothes on her back. She survived on berries and roots she dug from the ground by hand. When asked how she had managed to find her way home, she said simply, “I followed the river”—Virginia’s New River, that is. If there’s one river in Virginia that is under-utilized by anglers, it’s the New River. Beginning in North Carolina, the New River meanders back and forth across much of Virginia. The river consistently flows northwest and eventually meets the Gauley River to form the Kanawha in West Virginia. Ironically named, the New River is actually quite old. Some have speculated that the only the Nile in Egypt is older than the New. For many folks the New River is a place for rafting, kayaking, and swimming before a shoreline lunch. It’s also a must-fish location for smallies, blue gills, stripers, and of course musky. There are several good guides who call this river their home waters, including Britt Stoudenmire, owner of New River Outdoors Company, in Pembroke, Virginia. Stoudenmire fishes the river hundreds of days a year and knows the section that flows through southwest Virginia like the back of his hand. “This river is awesome, and landing 50-75 smallmouth bass in a single day is very doable in the later part of the summer,” Stoudenmire says. Early season fishing for beefy smallies in late March is also doable, but that style of fishing is generally done in deep water with conventional fishing gear. Stoudenmire should know, as his clients come from all over the country and stay for multiple days at a time in family-friendly cabins which he rents out to visiting anglers. Fly anglers who take on the New River can score big-time with a variety of patterns and differing methods of fly fishing. Musky anglers will need to cast big streamers with hooks as large as 6/0, and nearly as large as a small squirrel. Musky easily reach 15 pounds here and really aren’t considered big fish until well past the 30 inch mark. Be prepared, however, to do a lot of casting and not necessarily a lot of catching. Smallie anglers can score big time as well with top water patterns like Walt’s Poppers in sizes #6 to 1/0. These poppers aren’t easy to find but if you do, try Walt’s Carolina Blue Popper and his Tan-Bellied Frog in #6 and up. Streamers work very well on the New River, and no one knows that better than guide Mike Smith, owner of New River Fly Fishing and co-owner of Flymen Fish Company. Smith has helped develop an entire line of flies tailored for the New River. These patterns also work well in other rivers, and even have applications in saltwater as well. To get a closer look at the patterns Smith helped create, check out Flymen’s website. For more information on lodging options and fishing the New River for multiple species of fish, contact Britt Stoudenmire at New River Outdoor Company. Beau Beasley (beaubeasley.com) is an award-winning conservation writer and the author of Fly Fishing Virginia, and Fly Fishing the Mid-Atlantic. He writes for Blue Ridge Outdoors when he isn’t chasing fish with a fly rod.